Our official name is Ordo Supremus Militaris Templi Hierosolymitani, Latin for “The Sovereign Military Order of the Temple of Jerusalem”, and often shortened to the initials OSMTH or SMOTJ. Our Order was founded on the principles first adopted by the original Templar Knights in France in the Year 1118 and carried out in those early days from their home in the Temple of Solomon in the Holy City of Jerusalem, provided for them by then King of Jerusalem Baldwin, the Second. In these modern times, OSMTH is international in nature with members from over 40 nations, ecumenical Christian in our religious beliefs welcoming Members of all Christian religions, and focused on matters of human rights, political and religious freedom, and humanitarian aid to the world's less fortunate. We are officially recognized by the United Nations in Special Consultative Status and furnish OSMTH Official Delegations to the United Nations in New York City, Vienna, and Geneva. 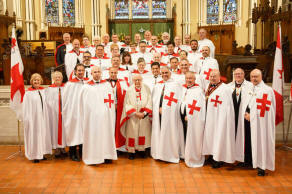 Like the Knights Templar of old, we operate as a modern-day worldwide network of educated professionals in such widely diverse protocols as senior government officials, Members of the Diplomatic Corps, senior clergy, military officers, physicians and surgeons, engineers, historians, and humanitarian aid caregivers. OSMTH represents many of the most respected and credible senior officials in their home nations, providing both a highly respected body of expertise, an influential voice to support commitment to the less fortunate of the world, and to promote the time-tested chivalric ideals of honor, honesty, civility, tolerance, care for our fellow man, and support for ecumenical religious faith throughout our individual nations and throughout the world community. We often find ourselves working with and through other Chivalric Orders, the senior leadership of other nations, and with other Non-Governmental Organizations [NGO] in order to provide humanitarian aid and other involvement in resolution of serious humanitarian needs or political, ethnic, and religious conflict. Engaging the respect and credibility of our world membership in their home nations, we are able to bring resolution and assistance in matters that quite often become bogged down in the bureaucracy of governments and regulations. Our objectives include the international promotion of inter-cultural and inter-religious contacts and worldwide networks in order to help build bridges of brotherhood between nations and cultures, as well as individual good works performed by individual anonymous Knights and Dames. As ecumenical Christians, we also seek to increase awareness of conflicts and their causes and in so doing, work towards their future prevention and ultimate peaceful coexistence of all nations. Because our Order began it's first work in The Holy City of Jerusalem in the 12th Century, The Holy Land and it's Cradle of Christianity are of the highest interest to us in this regard as evidenced by our most recent Trip To Jerusalem and our work there with the Senior Leadership of every Christian Church in Jerusalem. OSMTH aspires to foster a cosmopolitan society in which differences among peoples, cultures, and governments will be both respected and appreciated. We seek the betterment of humanity through education, world brotherhood, chivalric principles, and civil behavior and treatment among one-another. Our membership standards are purposely very high, our financial and time commitments are not for everyone, and our dedication to a more caring world requires significant expectations that not everyone can meet. But for those who qualify, the OSMTH Knights Templar Order offers an unequaled World class Chivalric Order with an international network of some of the most sophisticated and influential professional men and women from over 40 different nations. Here in Canada we have Priories in Windsor, Toronto and Ottawa all in the Province of Ontario and a Commandary in Edmonton. We are also in the early stages of working on developing a Commandary in Halifax, Nova Scotia. the contribution of the Knights Templar, medieval and modern, with regard to agriculture, construction, transportation, crafts, medicine, finance, inter-faith affairs, diplomacy and philanthropy is both well researched, and also widely understood and valued by the public. See http://www.osmth.org/ for further information on the International order. 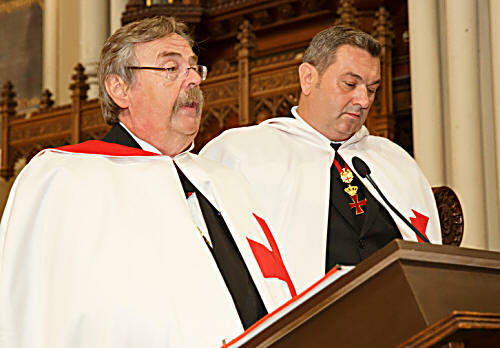 Alastair McIntyre, GOTJ, FSA Scot was the newsletter editor for the "Canadian Templar", the newsletter of the Grand Priory of Canada, copies of which can be downloaded below. He completed his four years work on the newsletter with the September 2016 edition. On Sunday 20th August 2017 it was announced that H.E. The Rev. 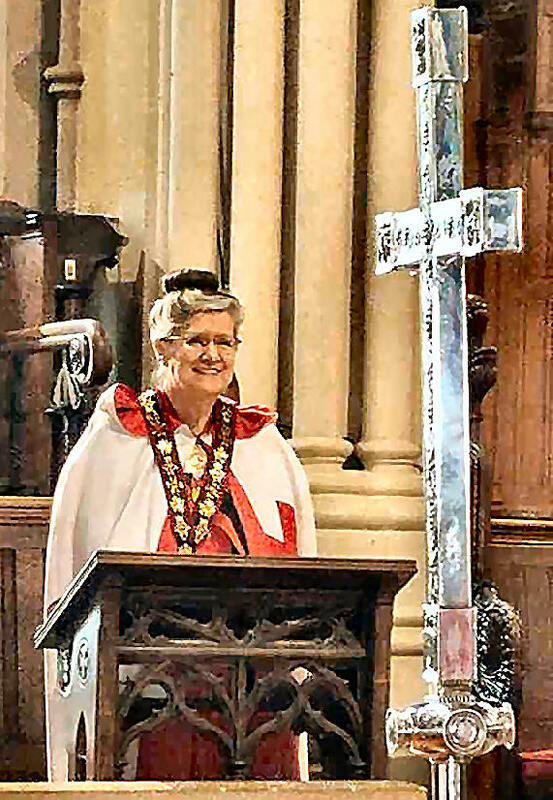 Dame Nola Crewe was to take over as Grand Prior of Canada at the September Investiture of St. James Priory in Toronto. Thank-you. Each and everyone of you, for the honour bestowed upon me this day. 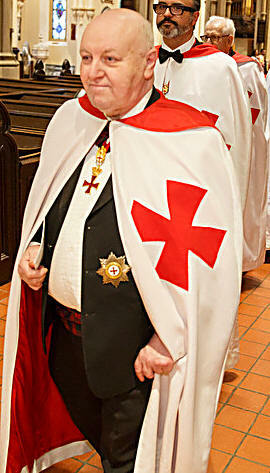 I commit myself and my term to doing all I can for the betterment of the Knights Templar Order: here and everywhere. As you know, I am following in the very large footsteps of those who established and expanded our Order in Canada. Clearly my high heels will leave different footprints on our journey. So, let me tell you a bit about my leadership style. I am a collaborative, committee-type of person. I like everyone to know what is going on . . . so that all can be held accountable for getting done what needs to be done. And all can bask in our successes. And that is only going to be possible when old foggies like me learn to use modern means of communications EFFECTIVELY to ensure that in this vast country, every Templar truly feels that they are CANADIAN Templars . . . well represented on the international scene and driven by the efforts and talents and wishes of their home priories. 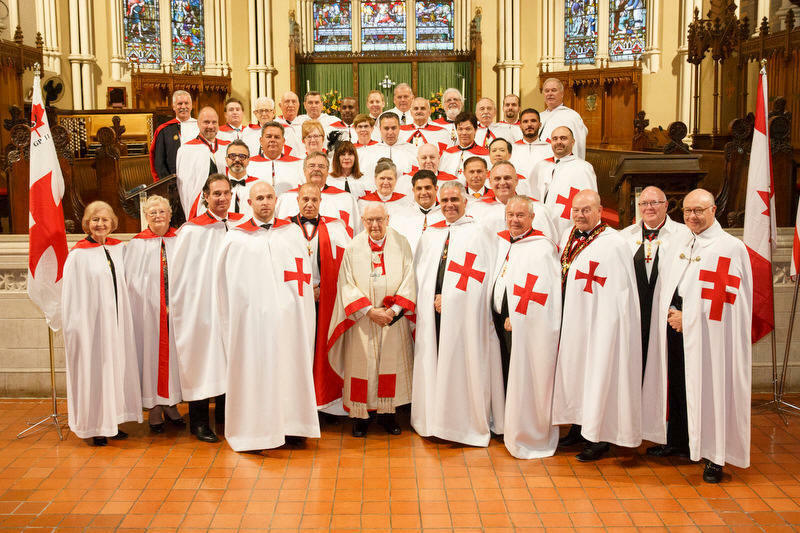 To that end we have to acknowledge that being a Templar means more than donning a mantle and turning out in one's best duds for the annual investiture. Delightful though that may be in our most public persona. In the months ahead, each Templar will be asked to work on a committee, on a project, on an event and all will be expected to pray regularly for all our efforts. Some will drive a car, some will write a cheque some will sew a mantle. Others will represent Canada on the international scene, and others will assume offices at home. Whether you choose to host a fund raiser, feed the hungry, share your knowledge of Templar history or sites on a pod-cast, chase down skates or bottles of water, eye glasses or running shoes . . . there is a role for you. We need to take advantage of the time and talents and gifts of our members. So, look about your table tonight and discover the talents lying before you. Look within yourself. And then make the commitment to share what you discover to make a better world the Templar way. And finally, my joy in your confidence in me cannot be overstated. My commitment is to give all I am to the challenge of leading our Order in Canada and representing it abroad. To each of you I say, call me out should I fail and disappoint you. I too must be accountable. And here, before you, I pledge my term to using the gifts God gave me to the service of Our Order . . . God willing. AMEN. [Toast] To you, the Templars!